Teaching new players a game is a dark art. It’s something that can vary hugely from game to game, and have a massive impact on players’ enjoyment, yet is discussed nowhere near as much as it ought to be. There’s an argument that well designed games shouldn’t need any sort of formal tutorial. That intuitive controls and smart level design will teach players through action and interactivity (or rather, trial and error). Whilst that’s the ideal solution for many games, it’s not appropriate for every game. Especially those, such as Totem Topple, which have a layer of conceptual abstraction: The player doesn’t actually have an avatar physically building the totem pole for them. 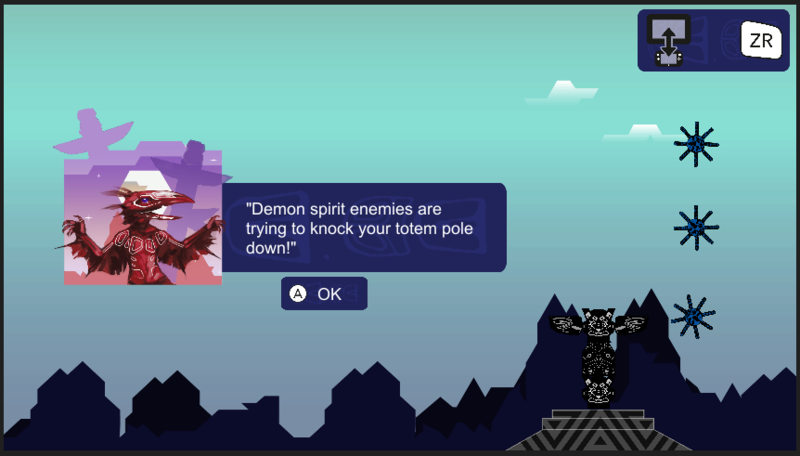 For Totem Topple, we have a “jump through hoops” style tutorial, where players are required to perform specific tasks, accompanied by contextual information explaining why they need to do them. Fortunately, most of the subtle complexity of Totem Topple comes from the decisions the player makes, rather than mastering the mechanics. The tutorial teaches the player how to press the buttons, without telling them which buttons might be good or bad to press in any particular scenario. However, it’s difficult to work out what each totem piece does simply from observing what they do in game. The heads in particular, there are no obvious clues from the way they look as to what exactly they do, (aside from delay inevitable death by making your totem pole that little bit taller). That’s largely a consequence of the art style used in the game, which for various reasons we can’t really change. Instead, Totem Topple has an in game Help system. 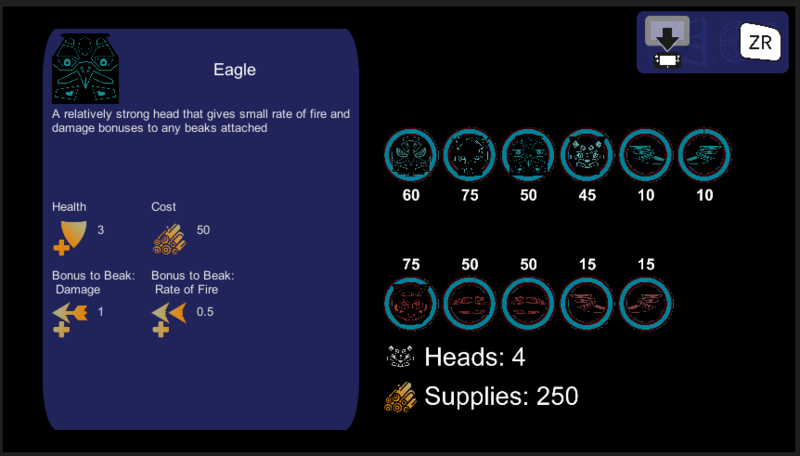 Players can call up the help system at any time, pausing the game and allowing them to get both descriptions and the underlying numbers / stats on different heads. Importantly, when played in Off-TV mode, players can also call up information on enemies and heads in play. This way, they can see the actual effect of placing this wing on that head, or how much damage this enemy took from that beak. Feedback is one of the more subtle systems to help bind action with consequence. It’s all the little visual and audio cues and clues that most of the time are only picked up subconsciously by the player. It could be as simple as having a sound play when a player presses a button, or having a big red minus flash when an enemy does damage to a wing or head. This is one area in particular we’re going to be adding to in the run up between now and launch.